A land of poets and troubadours such as Virgil and Sordello, illustrious writers such as Baldassare Castiglione and, in more recent times, major publishers and men of culture such as Arnoldo Mondadori, Matua has always been in the forefront of major cultural activities which have endured to the present day and have given birth to the now famous Festivaletteratura (Festival of Letters) which in September attracts the most famous national and international writers to a busy programme of appointments and meetings with the public. A city with many facets, Matua is an unmissable destination for either a short stay or as an ideal base for a longer visit to the Province of Matua and nearby cities including jewels such as Sabbionetta founded by the genius of Vespasian Gonzaga Colonna. Mantua born from the legend of Maga Manto, daughter of Indovino Tiresia , who fleeing from Thebes, took refuge on an island in the middle of a swamp and founded a small village which took her name. It first enters history with the Etruscans who, it is more likely, founded the city. It became capital of the territory of Matiilda of Canossa in medieval times and reached its greatest glory thanks to the advent of the Gonzaga family. Above all the Palazzo Ducale and the Castello of San Giorgio, ancient residence of the Gonzagas which houses in its salons frescoes by the greatest artists of the Renaissance and others such as Andrea Mantegna, Giulio Romano Pisanello and Raphael. 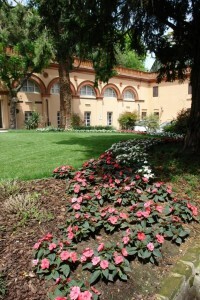 ( www.mantovaducale.beniculturali.it ), former residence of the Gonzaga, who keeps in his salons frescoes greatest artists of the Renaissance and not, as Andrea Mantegna, Giulio Romano, Pisanello and Raphael. You can take boat trips on the lakes surrounding the city ( www.motonaviandes.it ) or along the Parco del Mincio (www.fiumemincio.it ). The entire province is crisscrossed by a dense network of trails which allow you to discover the most romantic and enchanting corners. For more information: I.A.T. 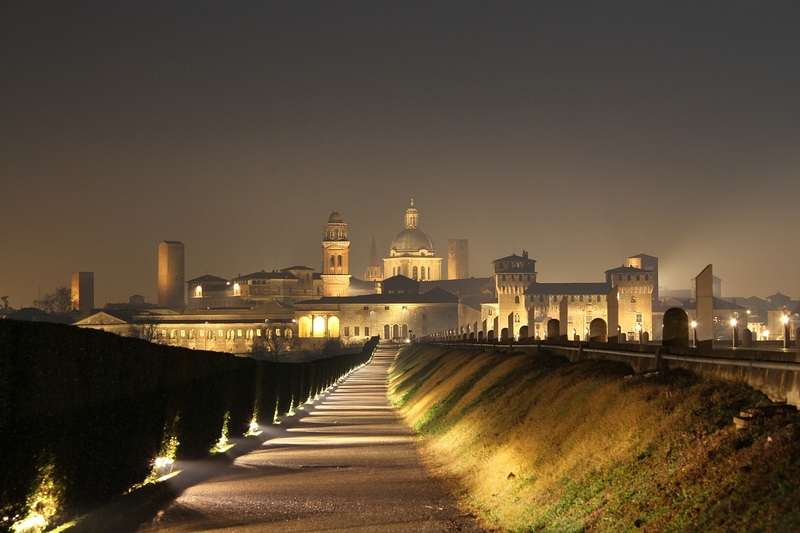 Mantova : 0376.432432 www.turismo.mantova.it. Mantuan cusine has been able to combine and enhance its natural resources and waters to create simple but rich dishes, prepared with products from the fertile and generous soil. Manua is known for its typical local dishes with particular strong tastes which have not lost their identity as simple but tasty food. Try the Tortelli di Zucca (pumpkin tortelli), risotto husked and pike in sauce or grilled. Pork dishes would require a separate chapter since pork is a historical resource of the city, such as risotto with sausage, pork sausages, salami and pista gras. As for cheeses Grana Padano excells, accompanied however by spicy mostarda made of campanine apples or pears whose strong flavour goes very well with cheese. Many dishes also have initiatives related to the taste and principles of the Slow Food Movement.